One person has been killed and three injured by shells that landed near the Russian embassy in Damascus, an RT Arabic correspondent reports. All of the victims are Syrians, RT Arabic's Abutaleb Albuhaya reports, adding that the fatality was an embassy security guard. The Russian Foreign Ministry has confirmed that a shell exploded near the diplomatic mission. "A mortar shell launched from an area controlled by illegal armed groups exploded 20 meters from the main entrance to the Russian Embassy complex," Foreign Ministry spokesman Aleksandr Lukashevich said in a statement. "As a result of the shelling, one Syrian serviceman was killed and one wounded. No embassy staff were injured." The Foreign Ministry condemned "this new terrorist attack." 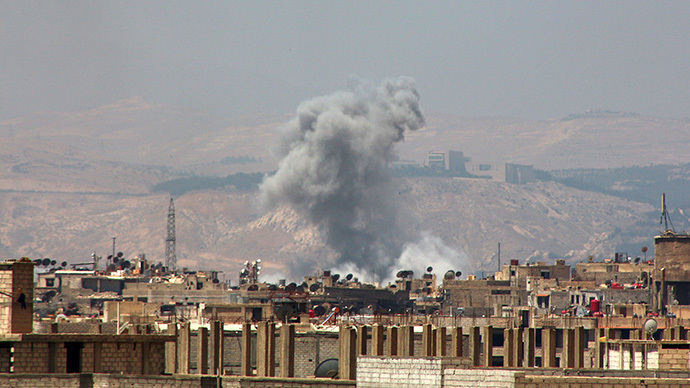 Syrian news agency SANA, citing a police report, said that two shells hit the al-Mazra'a district of Damascus, where the Russian embassy is situated. It reports one person was killed and three wounded, but says all of them are civilians. It is the second time in a week that shells have fallen near the Russian embassy. No one was killed or injured in the previous incident on Tuesday, when one shell hit an administrative building and another struck near the main entrance. They are thought to have been fired from the Jobar district of Damascus, controlled by illegal armed groups. Tuesday’s shelling was strongly condemned by Moscow, with the Foreign Ministry saying it is being treated as a terrorist act, and strongly condemning its "perpetrators, organizers and instigators." Syrian authorities promised to boost security and ensure the Russian embassy's safety. The UN condemned the attack and called for those responsible to be brought to justice. While Damascus based political commentator Alaa Ebrahim went further and told RT that the rebels are deliberately targeting the Russian Embassy. “They think of Russia as their direct enemy and they would like to inflict as much damage as possible on anything that symbolizes Russia’s presence in Syria,” he said.